In Pakistan, the blasphemy law carries a strict punishment for anyone deemed to have “insulted Islam.” If found guilty, the sentences can range from a heavy fine to the death penalty. The situation is made worse by a case being based on as little as one man’s testimony. Pakistani Christians – 2.5million – suffer disproportionately under the blasphemy law which is used to discriminate against all religious minorities in the country. However, the issue is controversial, meaning that the country’s authorities are reluctant to take any action against its misuse. 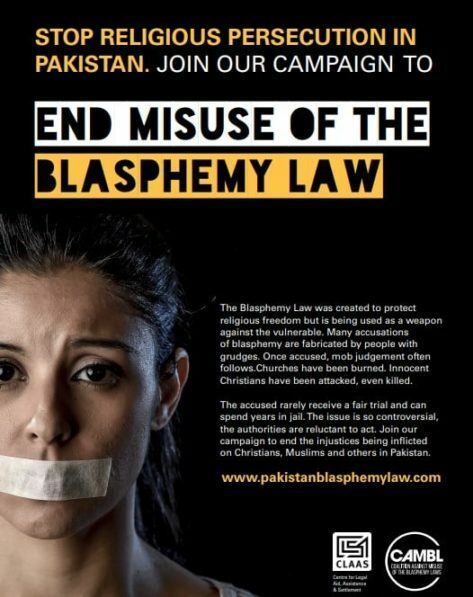 Therefore we are asking you to please join our campaign to end the injustice being inflicted by the misuse of the blasphemy law in Pakistan. Pakistan’s blasphemy law is a contentious issue around the world and it’s misuse must be stopped. There is currently no active petition, but we will keep you informed. Enter your mobile number to receive actions like this by text. You can unsubscribe at anytime. We will also call you about other ways to support our work.